LemonStand is a premium ecommerce platform designed for large businesses and developers. It’s trusted by a variety of different companies, including Bose, Zendesk, Zippo, the Anthony Robbins Foundation, Orb and Telltale Games. LemonStand is essentially a playground for developers who work with big clients or large ecommerce businesses who need developers to help build online stores capable of powering their monstrous businesses. It has little to no limitations for developers and allows them to design their way. Let’s find out what this service has to offer. Founded in 2010 and headquartered in Vancouver, LemonStand is still a fairly young company, but they’ve acquired much successful in a short amount of time. They work with over 2,000 customers who have an average revenue of $150,000+ per year. LemonStand’s team includes individuals with decades of experience in the ecommerce and corporate industries. They include CEO Danny Halarewich, who’s worked at such companies as Yahoo! and MasterCard, and CTO Bruce Alderson, who has more than 20 years of experience developing software. LemonStand comes with a number of different features that make it one of the best options for larger stores and developers who build eCommerce sites for clients. Let’s take a look at a few of these pros. LemonStand is a true, all-in-one solution that has or takes care of everything you need to run an ecommerce store. This includes hosting your site on a cloud server, giving it the ability to scale as needed so it never experiences any downtime or decreases in speed if you receive sudden spikes in traffic. It also comes with a global CDN with servers in 54 different locations around the world. This amplifies the speed of your site even further by serving certain elements of your site to visitors depending on where they’re located in the world. This means they won’t need to wait for it to load from the server your site is installed on. LemonStand also comes with free, easy-to-customize themes, powerful blogging capabilities and security features optimized for eCommerce. I was tempted to place this in the Cons list, but LemonStand has a few unique features you won’t find on any other eCommerce platform, features that will surely justify its cost for plenty of businesses. 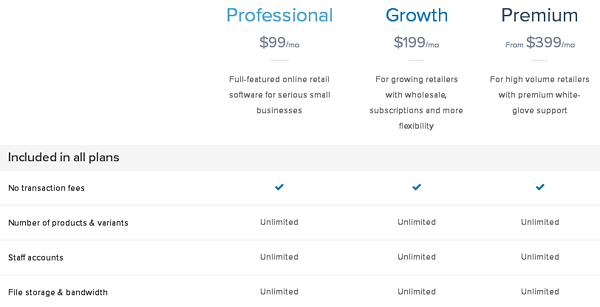 You’ll unlock new features when you upgrade, as is typical with any SaaS. For example, the first plan, Professional, allows you to process as many as 400 orders every month and receive support via email and live chat. You’ll be able to process as many as 1,000 orders and access priority support when you upgrade to Growth. You’ll unlock a few new features, including volume and customer group pricing, subscriptions and recurring orders, and concierge onboarding. The Premium plan allows you add over 2,500 products to your store and access priority support via phone. You’ll also be able to receive theme design updates and maintenance, custom feature development, custom app integration, a dedicated eCommerce success coach, and integration with Avalara, a popular tax calculator. LemonStand is no different from any other eCommerce platform at first glance, which is why I was tempted to add this section to the Cons list. However, there are a number of different features for developers that set this platform apart from the rest. More on that later. I already mentioned this in the previous section, but LemonStand charges no transaction fees on any of its plans. You will, however, be required to pay the fees the payment gateways you use charge. These are the types of features that set LemonStand apart from the rest. It has a number of different features that make it a powerful platform for developers. This includes the ability to use Bootstrap, Angular and React as frontend frameworks and a tool called LemonSync for local development. It also has a theme engine that uses the Twig language as well as free and open-source themes. Different plans also give you access to different levels of the LemonStand API as well as a developmental sandbox. You can also join the LemonStand Agency Partner Program if you build a lot of eCommerce sites for a lot of different clients. It allows you to use LemonStand as your official platform for building new stores and enjoy a hands-off approach when it comes to software and hardware maintenance. You’ll also earn a 20% recurring revenue share and be able to join the LemonStand development community on Slack. 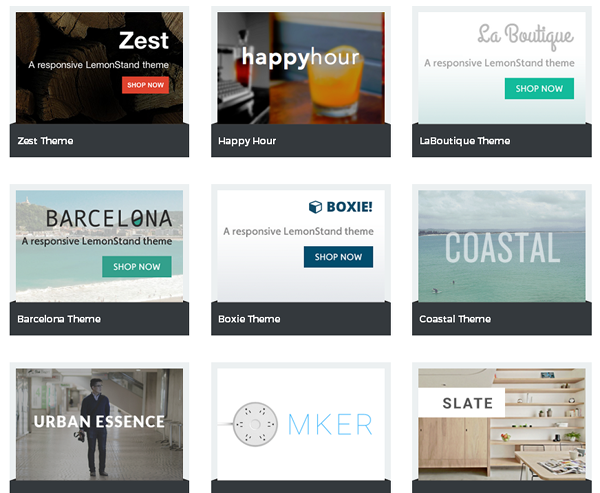 LemonStand has 13 free, well-designed themes and one barebones theme that allows you to start from near scratch. It’s easy to change the colors and styles of these themes, but it’s not easy to change much else. This is why this platform works best when used by developers or businesses willing to pay for professional development. 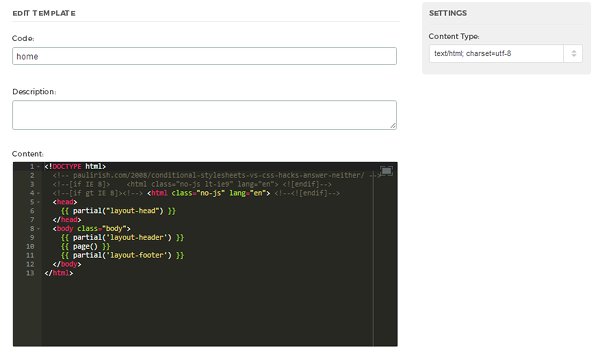 Developers can access every part of the theme. This includes every template and resource file. 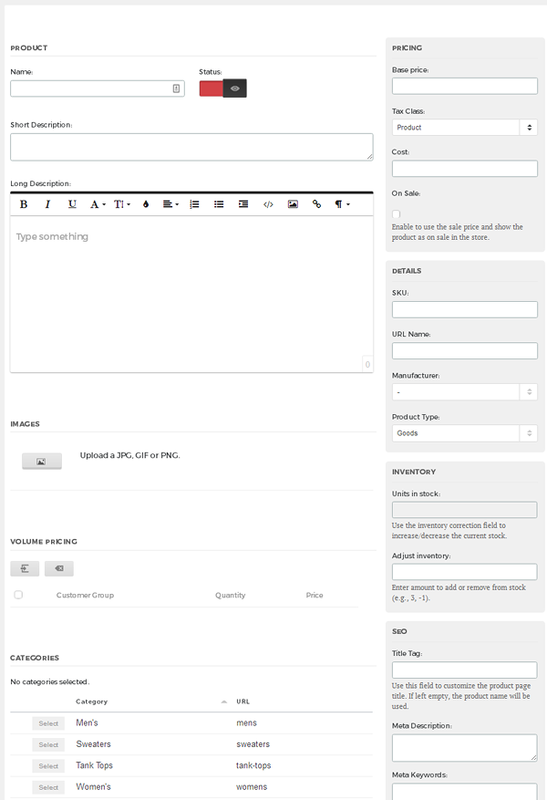 Thankfully, adding new page content and blog posts is as easy as can be with the built-in WYSIWYG editor. LemonStand sites come with built-in security features, as mentioned before. This includes the global CDN mentioned earlier, which protects your site from major, sitewide DDoS attacks. LemonStand is also PCI compliant and protects all pages with SSL encryptions. Real-time carrier rates allow you to show up-to-date rates from such carriers as USPS, UPS and FedEx while table rates allow you to define shipping rates based on location, weight, price and other factors. That’s more or less all of the main shipping features LemonStand comes with. You can add more functionalities through integrations, such as an integration with ShipStation that allows you to print labels from your office to save time when you drop off packages at your carrier. We’ve already mentioned that LemonStand offers support in the forms email, live chat and phone and that the two most expensive plans give you access to different levels of priority support. The most expensive plan gives you access to a dedicated eCommerce success coach. Other forms of support include a large knowledge base filled with dozens of helpful articles designed to help you guide yourself through common issues. You can also learn about the service and ecommerce in general by reading the company’s blog. Creating new products with LemonStand is more or less the same as it is with any other ecommerce platform. You can add a name, short description, long description, base price, tax class, cost, sale price, volume pricing, an SKU code, a manufacturer and product type. There is an interesting feature that seems unique to LemonStand, and that’s its automatic inventory-adjustment feature. You can enter stock amounts for each product when you create them and choose what happens when customers buy that product. You can hide the product when it goes out of stock, allow pre-orders before it’s in stock and let the product have a negative stock balance. You can also display how much of an item you have in stock and have that number adjust on the frontend automatically when customers purchase it. All other product features are standard for the eCommerce industry. This includes the ability to add SEO elements to each product, such as titles and meta descriptions, the ability to create parent and child categories, the ability to add variants, attributes and options as well as the ability to let customers add extras at additional costs. The backend of LemonStand allows you to keep track of a number of different areas of your shop, including orders and customers. You can also keep track of individual transactions, inventory and subscriptions. 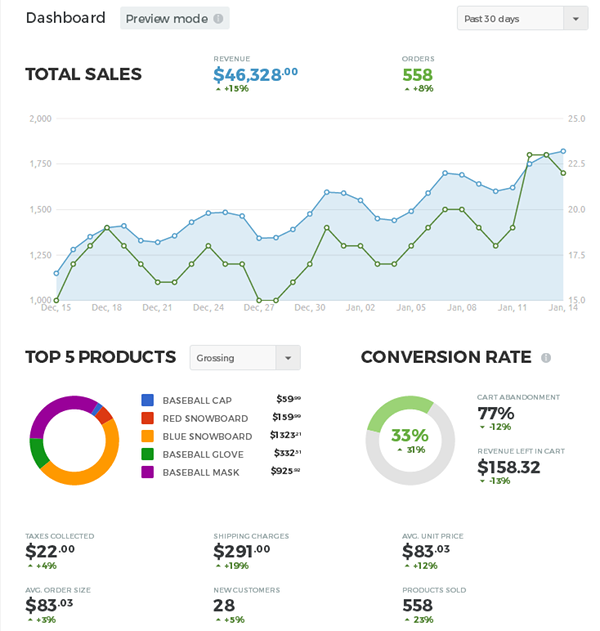 You can review your sales in a graph and summary to see how well your shop performs over time. You’d think a platform as powerful and expensive as this would have no faults, but unfortunately, you’d be wrong. Let’s take a look at a few of LemonStand’s disadvantages. You may have noticed that each plan LemonStand offers has an order limit. You’ll be upgraded to the next plan up automatically if you go over this limit every month for 3 months. If you’re on the Premium plan, however, you’ll be charged an additional $100 for every 1,000th order you process once you go over that 2,500 order limit. LemonStand is a powerful platform nonetheless, but it’s worth taking these additional costs into consideration if you’re thinking about using this service and plan on growing big quick. LemonStand has a lot of integrations, but it’d be nice if a service this expensive would allow you to use additional sales channels without having to set up third-party integrations. What I mean is there’s no built-in POS channel, no way to sell on Facebook, Pinterest or Twitter, and no built-in integrations with marketplaces. Again, LemonStand is expensive, so it brings nothing but disappointment when you find out how lackluster its reporting and analytics sections are. It does have integrations with third-party services, but it’d be nice to have these features built in as well. One feature that’d be nice to have are reports and analytics that allow you to make smart decisions in regards to your business, such as which under performing products should be bundled together to encourage sales, who your most valuable customers are and which valuable customers haven’t purchased anything in a while. LemonStand isn’t significantly more powerful than other eCommerce platforms out there, but it’s definitely one of the best platforms for developers. If you’re the owner of a small to medium-sized eCommerce store or don’t wish to hire a professional, keep this one off your list of considerations. If you’re a large or rapidly-growing eCommerce business or a developer who builds eCommerce sites for clients professionally, be certain to check this platform out. Click the link below to visit the site.